2nd Annual Great Spring Cloth Giveaway. Over $400 in Prizes! 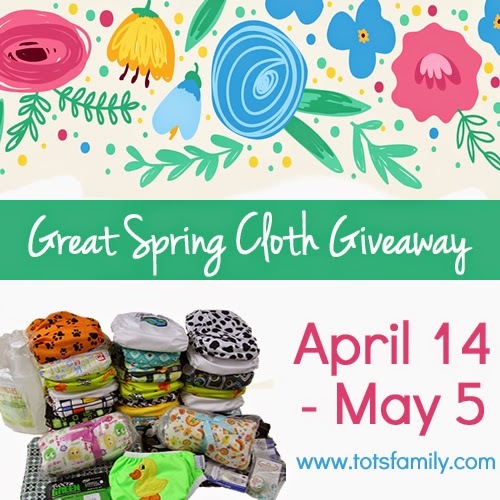 I am excited to help celebrate the launch of the 2nd Annual Great Spring Cloth Giveaway. It is finally spring. For so many of us Canadians & Americans all over you know I really mean finnnnnallllly. The weather is getting warmer, wetter and none of those pesky mosquitoes are out yet. It is even finally ok to sun diapers outside again (well mostly I think haha). From April 14 – May 5th you can enter to win an amazing cloth diaper prize pack with everything you need to start cloth diapering or just expand your stash. Prize includes 20 pocket style cloth diapers, wipe cubes, Goodmama wipe cloths, Bumble multi use zip up bags, an amber teeth necklace/anklet set and some other fabulous cloth diaper goodies. Great Spring Cloth Giveaway is hosted by Thinking Outside The Sandbox: Family, Flip Size Canada and From The Stash. Special thanks to the following businesses/bloggers for helping with shipping costs (this prize box is going to be HUGE!) – A Mother’s Design, The Inquisitive Mom, Creative Kids, Surviving Chaos, Your Modern Family, Zephyr Hill, Cloth Diaper Contests, The Anti June Cleaver, More Than A Mom of Three, The Parenting Patch, Jen’s Butterfly Bowtique, Thinking About Cloth Diapers, Livin' La Vida Eco and Housewife Mama. How do I enter this amazing giveaway? Enter using the Gleam widget below. One lucky winner will win everything. Enter as many (or as few) times as you would like. The Great Spring Cloth giveaway is open to both USA and Canada. wanna win! Am i the first to comment!!?? I currently cloth diaper and love it but we need more of a stash. I currently cloth diaper and I am looking to build up my stash because #2 will be here soon! Would love to win this for my pregnant sister who plans on using cloth diapers. I have my whole stash, time to share the love of fluff! I cloth diaper my first and am pregnant with my second which I also plan to CD. I have been cloth diapering for 10 years through 5 kids with number 6 on the way any day now! Planning to cloth diaper when my LO gets here in October! I cloth diaper. I'm trying to win this to share with a friend. I am currently cloth diapering with my second daughter! I cloth diapered my now 3 year old and currently diapering my 2 year old expecting another back and the diapers I have just won't be enough. clothing diaper child 1, Baby due in Oct will also use them, could use new ones to replace my worn ones. i currently have three in cloth!! I use cloth!! I have a 2 1/2 year old that uses them at night, a 6 month old and one due in November! We do cloth diaper but could always use a bigger stash. I want some diapering stuff!!! Pick me!! I'd love to win! Pick me please! Cloth diapering this baby due soon! yes i cloth diaper my son! and love it the only way to go!!! This is my first timing doing cloth. would love to win this!! We cloth diaper and this would be great to enlarge my stash and share with others in need! I cloth diaper and want to build up my stash before I have a second child. Would be awesome for a CD newbie like myself! I currently cloth diaper but don't have a very big stash at all (just about 1 days worth) & definitely need more. Yes, I currently cloth diaper our 3rd child and will be doing so with our 4th due in June. We cloth diaper full time with our first. I would love to win this prize - what a great way to start our diaper stash for our new baby due any time in the next 4 weeks!! I'm going to use cloth diapers for my twins. Due September. I've been cloth diapering for nearly 7 months now. i learned their name is Jenn also and shes a WAHM of 5 beautiful kids and her hubby is a medic in the US Army. We cloth diaper, but I'm still building my stash slowly! We have been in the process of trying to find what works for us. we love cd'ing and i would love to gift this to my international friend who is here for school. due with her first ds on 4/26! I am brand new to CD and trying to build a stash. justjenuwine.blogspot.ca belongs to a WAHM. She has a boutique where she sells hair accessories and toys and games. Crossing my fingers for a WIN!!! Baby due May 18th! I am currently cloth diapering my 7 month old, I also cloth diapered my now 3 year old! I have cloth diapered my now 4 1/2 month old since he was 3 weeks old! I love it! This would be a great addition to my stash since I also want to add an addition to the family! I only have 10 Cheapies so I would e to win this for my daughter and future baby! I am expecting due 6/16/14! It is our first bundle of joy and we are planning on cloth diapering! I currently cloth diaper, but I actually just had twins 1/24/14 and we desperately need a bigger stash. The fluffy butts are hard to cover!!! I would love to win this pack!! Yes. I cloth diaper. I could definitely use more! Just placed my first cd order to start. 3rd baby. 6 months. I'm excited. This would be SUPER AWESOME!!!!! good luck y'all! I'm expecting! Will be cloth diapering! I cloth diaper my 19 month old and plan to cloth diaper my next one due in October! I'ma first time mom and would love help starting my cloth diaper stash! Where do we tell you the one thing about that blog? I clicked continue because I thought it would take me to that spot, but now I can't look at the entry again. I do cloth diaper but not full time yet. I am currently cloth diapering my second child. I love trying new brands of diapers though, to find the perfect fit! Thank you for a great contest! I used cloth with my first and am expecting baby #2 in less than a month and plan to use cloth from the start! I am expecting a baby in 3 months and am planning to use cloth! Love cloth diapering our 5th baby (a boy). In need of more CD's since my main stash is mainly girly colors. Thanks for the chance to win. We are expecting our second child and we plan on cloth diapering this child! I would love to win this stash to help start a stash for us! I've been cloth diapering off and on for 22 years. Just started cloth this week and loving it! Yes I CD my 7 month old and plan to CD any future children as well! I've been cloth diapering for almost 20 months! :) I started when my son was 6 months! Going strong. We cloth diaper and we loveeee it! We've been cloth diapering for about 5 months now and are SO glad we made this choice. We are loving it! I am currently pregnant with #5 and have been CDing since #2. I recently whittled down my stash since some of my diapers have seen better days : ) And to tell you something about The Butterfly Affect website, she has a ton of giveaways and I am really interested in the books she mentions on March 25th. I love sci-fi! yes i cloth diaper with my 10 month old! I am currently cloth diapering my 3.5 month old son. I would love to win!! Goodluck everyone!! yes i cloth diaper, my LO is 11 mo and have clothed since she was 3 mo. I wish i would have done it sooner though. love it! Winning this would be like winning the lottery to me! We clothed diapered our second after my poor first daughter experiencing terrible chemical burns with disposables. Haven't turned back! Expecting again in June and fully intend on cloth again this time! Would absolutely love to win this! Love cloth diapering! Could totally use this for number two who will be arriving in September!